"41CE20-1" by Timothy K. Perttula and Robert Z. Selden Jr.
DECORATION (INCLUDING MOTIF AND ELEMENTS WHEN APPARENT): Vertical engraved panels (four on the body) filled with vertical scrolls, hatched triangles, and concentric circles and semi-circles. One of the circles has central hatched lines, and hatched oval areas also have excised spurs. The panels are divided by a single vertical engraved line and there are three horizontal engraved lines that encircle the bottle at the top of the neck. 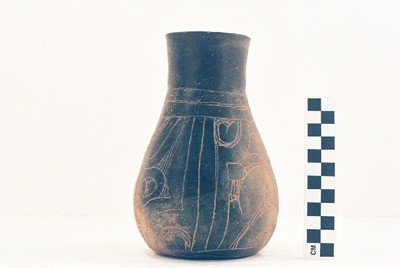 Possible Poynor Engraved bottle from the R. F. Wallace site.